The new airbrushed piece by Herman Veltorp of the Netherlands is a tribute to the late Peter Brothers with a “missing man formation” of three preserved Spitfires. Air Commodore ‘Pete’ Brothers, CBE, DSO, DFC & Bar was one of the prominent RAF fighter aces of the war, scoring a total of 16 kills, 10 of which were during the Battle of Britain. Brothers first saw action during the Battle of Britain as a flight commander in No 32. Squadron based at Biggin Hill, flying Hurricanes. By the end of August 1940, he was officially recognised as an ace, having shot down eight enemy aircraft. In Spetember of that year, he was transferred to No. 257 Squadron, also at Biggin Hill. Next posting came in 1941 as CO of No. 457 Squadron RAAF. Soon afterwards, Brothers and his unit converted to Spitfires. In October 1942, he took command of the Tangmere Wing. In 1944 Brothers took command of the Exeter Wing, leading his six squadrons on attacks against transportation targets and enemy airfields on the Brest peninsula and in Normandy. Heavily involved in the lead-up to the Allied invasion in June 1944, his squadrons operated in support of the beachhead. On August 7, 1944 he achieved his sixteenth and final success when he shot down a Focke Wulf 190 over the river Loire. By 1945, he had flown 875 operational hours and was credited with having shot down 16 enemy aircraft and damaged many more. 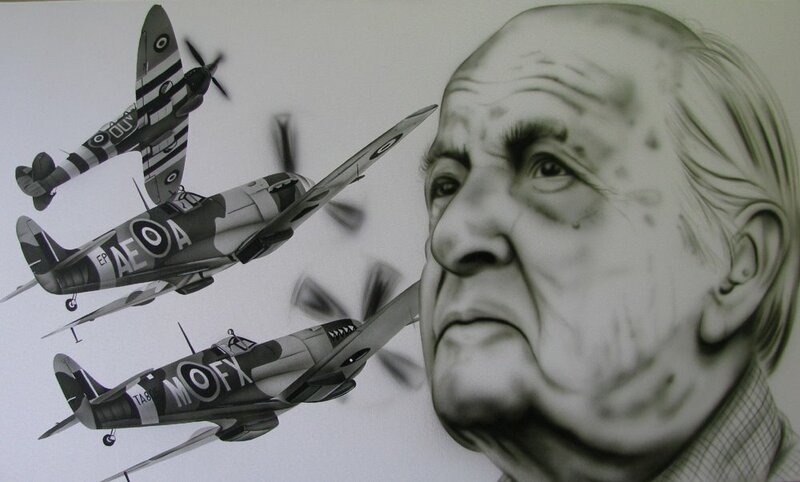 Late in his life Pete Brothers became the Chairman of the Battle of Britain Fighter Association. He died, aged 91, on 18 December 2008. Airbrush on canvas, 60 x 100 cm. Herman Veltrop’s website is abailable at www.airbrushpower.nl.